Not to be confused with Brighton Airport. Brighton City Airport (IATA: ESH, ICAO: EGKA), also commonly known as Shoreham Airport, is an airport located in the parish of Lancing in West Sussex, England. It has a CAA Public Use Aerodrome Licence that allows flights for the public transport of passengers or for flying instruction. Founded in 1910, it is the oldest airport in the UK and the oldest purpose-built commercial airport in the world. It is now owned by Brighton City Airport Ltd (BCAL). The 1930s Art Deco terminal building designed by R Stavers Hessell Tiltman is listed grade II*. 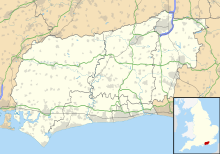 The airport is 1 NM (1.9 km; 1.2 mi) west of Shoreham-by-Sea at Lancing in the Adur district of West Sussex. It is situated immediately to the south of the A27 road, between Brighton and Worthing, and immediately to the north of the West Coastway railway line. The first aviator to fly there was Harold H. Piffard in 1910; a memorial garden celebrates his flight. The aerodrome was officially opened on 20 June 1911. The first flying school opened in 1913. During the First World War the aerodrome was used by the Royal Flying Corps. It was the departure point for some of the earlier flights, using Blériots and BEs, to join the conflict across the Channel. The aerodrome became an airport for the adjacent towns of Brighton, Hove and Worthing. It was officially opened on 13 June 1936 under the name Brighton Hove and Worthing Joint Municipal Airport. The new terminal building was built in 1936 and was designed by Stavers Tiltman in the Art Deco style. The terminal building is still in use and was designated a Grade II* listed building in 1984. The airfield started the Second World War in civilian hands until a detachment of Westland Lysanders of 225 Squadron arrived in July 1940 to undertake coastal patrols. With the nearby RAF Tangmere damaged by air raids the Fighter Interception Unit with the Bristol Beaufighter moved to Shoreham although they had problems with the grass runway. In October 1940 422 Flight arrived with the Hawker Hurricane operating as night-fighters. By October 1941 both units had moved away from Shoreham. In February 1943 the Defiants were replaced by Supermarine Spitfires and in April 1943 the airfield became a practice camp to RAF Regiment gunners in the anti-aircract role. Lysanders appeared again but this time to tow targets for the regiment gunners. A gunnery training dome was built on the northern perimeter of the airfield that still survives into the 21st Century. In April 1944 No. 345 (Free French) Squadron arrived with Spitfires to support the preparation for the Normandy invasion, the squadron was active on D-Day over the beaches and escorting glider formations. No 345 Squadron moved out in August 1944 and 277 Squadron in October 1944 and the airfield went into care and maintenance and was little used for the rest of war. The airfield was bombed several times and a Messerschmitt Bf 109 was shot down by ground fire during one such attack, crash-landing near the terminal building. A B-17 Flying Fortress crash-landed at the airfield after being damaged during a raid on Germany. The consequent damage to the old guardhouse on the north side of the airfield can still be seen. The landing area was entirely grass until a tarmac runway was built in 1981. In 1949, F G Miles Engineering Ltd moved to Shoreham from Redhill Aerodrome and soon occupied the repaired Municipal Hangar. Beagle Aircraft Ltd (British Executive & General Aviation Ltd) was formed at Shoreham on 7 October 1960 and design drawings were begun a few weeks later for a new prototype twin-engine light transport aircraft. Built as the Beagle B.206X at Beagle's Rearsby factory near Leicester, this promising new type was completed at Shoreham and first flown by John Nicolson on 15 August 1961. Beagle Aircraft Ltd was nationalised in late 1966 and taken over by the British Motor Corporation but later entered receivership in late 1969 and soon closed down. In 2006, due to mounting debts the airport was sold by the local authority to a property company on a 150-year lease. It was intended that the airport would provide increasing commercial flight activity for the conurbation on the coast nearby, particularly the city of Brighton & Hove. The airport is used by privately owned light aeroplanes, flying schools, and for light aircraft and helicopter maintenance and sales. A number of operators provide flying lessons, sight-seeing and pleasure flights, including the experience of flying in two T-6 Harvard World War II training aircraft. On 2 May 2014, Brighton City Airport Ltd (BCAL) took ownership of the airport and its operations, which at the time was named Shoreham Airport, taking over from Albemarle. Once the takeover was completed, the airport was officially renamed as Brighton City (Shoreham) Airport. Since June 2015, Wild Life Festival, a live music event developed by Disclosure and Rudimental has been held at Brighton City Airport. Fairey Swordfish torpedo bomber at 2011 airshow. The airport used to host the Royal Air Forces Association (RAFA) Shoreham Airshow (for around 25 years). On 22 August 2015, a Hawker Hunter jet fighter taking part in the airshow crashed onto the A27 road just outside Brighton City Airport, killing 11 people, and the show has not been held since. There is one terminal building at the airport, together with flight indicator boards announcing all arrivals and departures, a live runway camera and a licensed restaurant called The Hummingbird Restaurant and Cafe. The airport houses Northbrook College's engineering department — a Centre of Vocational Excellence (CoVE) in Aerospace and Aviation. A number of aerospace and aviation and non-aviation commercial businesses have offices and workshops on the airport site and along the perimeter road. The largest operator is Flying Time Aviation, providing integrated commercial pilot training, with a fleet of Diamond Aircraft DA40s and DA42s. The visitor centre features exhibits about the airport's history and area aviation history, a library and archive of related historic materials and guided tours of the airport. The airport is served by Shoreham-by-Sea station on the West Coastway Line, 1 mile (1.6 km) distant. A halt, Bungalow Town Halt, had been opened in 1910, just in front of the main building. In 1935 its name was changed to Shoreham Airport. The station closed in 1940. Various air taxi companies are based at the airport. Brighton City Airways operated out of the airport to Paris Pontoise airport but ceased operations in 2013 after encountering problems setting up a point of entry at the French airport. The South East Air Support Unit formerly operated from Brighton City Airport. Previously Sussex Police Air Operations Unit, the unit moved in summer 2007 to Dunsfold Park, west of Gatwick Airport, before moving to its present base at Redhill Aerodrome in autumn 2013. The Shoreham Airport Rescue and Firefighting Service provides a professional fire-fighting capability at the airport during operating hours. Headed by a senior airport fire officer, the service's two watches (Blue Watch and Red Watch) man two fire appliances. The service has operated at the airport continuously for over 90 years. Due to its listed period buildings and facilities, Brighton City Airport has been used by film-makers seeking to portray a small town airport, or even for historical reconstructions of scenes from the 1930s onwards. The airport has appeared in the Netflix TV series The Crown and three episodes of Agatha Christie's Poirot ("The Adventure of the Western Star", "Death in the Clouds" and "Lord Edgware Dies"). External shots of the airport were also used in the films The Da Vinci Code and Woman in Gold. The airport was used in the feature-length documentary Angel Without Wings and A Dark Reflection. ^ "Data and analysis – UK Civil Aviation Authority". www.caa.co.uk. Archived from the original on 2 April 2015. Retrieved 24 April 2018. ^ a b "New plan 'safeguards future of Shoreham Airport'". worthingherald.co.uk. Archived from the original on 2 May 2014. ^ "Heritage Gateway – Results". www.heritagegateway.org.uk. Archived from the original on 13 August 2017. Retrieved 24 April 2018. ^ Royal Flying Corps WW1 Blériot XI reconnaissance monoplane | "Archived Document". Archived from the original on 21 February 2015. Retrieved 21 February 2015. ^ Historic England. "Monument No. 1409758". PastScape. Retrieved 6 October 2015. ^ Pocock, D A (1995). "The Royal Air Force Regiment; The Formative years to 1946". RAF Historical Society (15): 23. OCLC 21256749. ^ "About Brighton City Airport – Flying With Us – Shoreham". flybrighton.com. Archived from the original on 21 October 2017. Retrieved 24 April 2018. ^ "Nas, Mark Ronson, Earl Sweatshirt added to Disclosure and Rudimental's Wild Life festival". NME.COM. Archived from the original on 31 January 2015. ^ "Shoreham air crash death toll 'rises to 11'". BBC News Online. Archived from the original on 23 August 2015. Retrieved 23 August 2015. ^ "Tennis Shoes and clothing online outlet UK sale : 2016 newest". www.sarffs.co.uk. Archived from the original on 24 April 2018. Retrieved 24 April 2018. ^ "Airport fuelling team webpage". sarffs.co.uk. Archived from the original on 13 August 2017. Retrieved 24 April 2018. ^ ""Agatha Christie's Poirot" Lord Edgware Dies (TV Episode 2000) – IMDb". IMDb. 11 June 2000. Archived from the original on 9 December 2007. ^ "Poirot Locations – Lord Edgware Dies". tvlocations.net. Archived from the original on 3 March 2015. ^ Eirik. "Investigating Agatha Christie's Poirot: Episode-by-episode: Lord Edgware Dies". investigatingpoirot.blogspot.com.es. Archived from the original on 18 October 2014. ^ "Secret Da Vinci Code airport set revealed". The Argus. 9 January 2006. Archived from the original on 19 August 2016. Retrieved 16 September 2007. ^ "Angel Without Wings". Fact Not Fiction Films. 31 March 2011. Archived from the original on 10 November 2011. Retrieved 28 October 2011. Brooks, Robin J. (1996). Sussex Airfields in the Second World War. Newbury, Berkshire, England: Countryside Books. ISBN 1 85306 259 6.